There are no second chances! 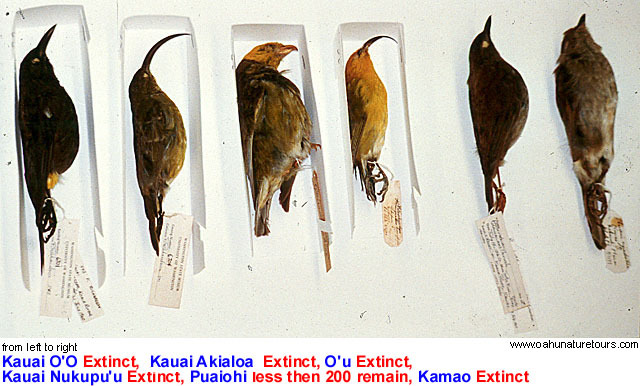 Hawaii is the bird extinction capital of the world. bird endangerment capitals of the world. The Passenger Pigeon, once probably the most numerous bird on the planet, made its home in the billion or so acres of primary forest that once covered North America east of the Rocky Mountains. Their flocks, a mile wide and up to 300 miles long, were so dense that they darkened the sky for hours and days as the flock passed overhead. Population estimates from the 19th century ranged from 1 billion to close to 4 billion individuals. Total populations may have reached 5 billion individuals and comprised up to 40% of the total number of birds in North America. that these birds would no longer be with us! The immense roosting and nesting colonies invited over-hunting. Tens of thousands of individuals were harvested daily from nesting colonies, and shipped to markets in the east to make pigeon pie. Modern technology hastened the demise of the Passenger Pigeon. With the coming of the telegraph, the locations of flocks could be ascertained, and the birds were rentlessly pursued. To add insult to injury, continous clearing of the forests on which these birds depended limited the nesting habitat that they could use. The last Passenger Pigeon, named Martha, died alone at the Cincinnati Zoo at about 1:00 pm on September 1, 1914. Who could have dreamed that within a few decades, the once most numerous bird on Earth would be forever gone? In short, extinction happens one stupid human step at a time. There are over 9,900 known species of birds. Since 1500 A.D., 128 have become extinct, plus a further 22 species that must be considered hypothetical. 103 species have become extinct since 1800 A.D.
One in eight of the remaining species, 1,183 bird species (or 12%), have a real risk of becoming extinct in the next 100 years. 182 species are Critical, meaning that they have only a 50% chance of surviving over the next 10 years (or three generations). 321 species are considered Endangered, meaning that they have only a 20% chance of surviving the next 20 years (or five generations). 680 species are considered Vulnerable, meaning that the probability of extinction in the wild is greater than 10% in the next 100 years. An additional 727 species are Near-Threatened, meaning they do not quite meet the criteria for the previous three categories. The human race seems to be getting better at this extinction game. in the history of the world. What has changed? A simple review of the World Bird Gallery illustrates the problem. Many birds face multiple threats. This table identifies the key threats that are driven by the human species. We are introducing new predators, like cats and rats, that isolated species have never learned to deal with. Join your local bird club and pay your fees regularly. Buy only Shade Grown Coffee - see the Shade-grown Coffee Page to see which birds ar losing their habitat. REMEMBER THEM WHEN YOU ARE GONE! Leave money to the birds by specifying your donations to local (or international) organizations in your last will and testament. 2003, pp.394-402. ), explains the Economics of Birding, and how birding ecotourists can contribute to local economies to support and protect bird habitat. LOBBY with your local govenment. Keep your government accountable regarding their environmental practices. ADOPT A BIRD. There are many organizations that are fighting for specific bird species. Make a donation!